A football stadium full of rabid fans has transcendental potential to address pressing environmental issues and ugly social and economic divisions. Imagine that: sustainability in sports! The great majority of people are fans of one sport, or another. Some more rapid than others (stand up all you Eagle fans!). Others tune-in during major events like the Olympics, World Cup of Football (that’s soccer to you America! ), or Super Bowl. Whatever type of fan you are, and whichever sport you enjoy, if you also aspire to greater sustainability, you might feel squaring your love of the ‘game’ with your love of the planet is not always easy. 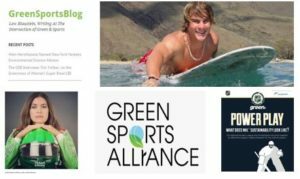 In this Sustainable Century Podcast, Lew Blaustein of Greensportsblog, explains the power of sports as an agent of change. Through the concerted actions of sports professionals, teams like the Philadelphia Eagles, and leagues like the National Hockey League sports are addressing significant environmental impacts and issues. This is Sports and Sustainability 1.0. Hear Lew tells us about Sports and Sustainability 2.0 and converting sports fans to sport and sustainability fans. It is even more exciting when we consider sports fans come from all walks of life and political persuasions. This gives sustainability in sports the potential to be a transcendental force for positive change. Take a listen to Lew and I when we discuss this and other sustainability in sports topics. Hope you enjoy, and may your team always play its best it can!